UAB gets a fresh start under Bill Clark, who takes over for Garrick McGee. McGee seemed overmatched from the start and finished a two-year run with a 5-19 record. The biggest embarrassment came in McGee's finale — a 62-27 beating at the hands of Southern Mississippi. That ended the Golden Eagles' 23-game losing streak. McGee had clearly lost his team and Clark will be an upgrade no matter what. It's clear the heat is on Neil Callaway, who returns for his fifth season as UAB coach despite a record of 15-33. The nonconference schedule is challenging, including games against Florida and Mississippi State. Complicating matters is that the team plays only five home games. Poster designed by Old Hat Creative. Click the image to enlarge. The Blazers have shown improvement under fourth-year coach Neil Callaway. His 2007 team was 2-10, and he followed with a 4-8 record in 2008 and 5-7 mark in 2009. Becoming eligible for a bowl is the next step, but this year's team is 0-2, having lost to Florida Atlantic and Southern Methodist. Making it to the postseason will be difficult with road games at Tennessee and Mississippi State yet to come. As a run-up to the start of the season, the Wiz will display one poster each day until our supply is exhausted. Then we turn it over to readers, who will vote on the poster of the year. We're in the home stretch, so if you haven't seen your team's poster on the site, now is the time to send it in. Email: jayzuma (at) gmail.com. Last year, the site displayed 69 posters. This is poster No. 76 for 2010. Poster designed by Old Hat Creative. 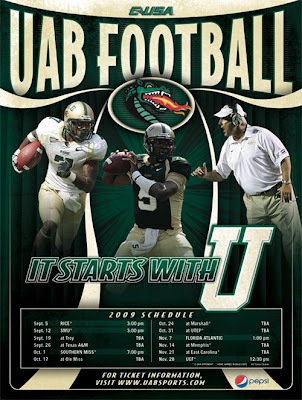 Wiz correspondent Greg spent part of Saturday at the Alabama Birmingham scrimmage that closed spring practices. As you can see, it wasn't difficult to find a good seat at Legion Field. This underscores the reality in Division I-A college football in 2009. There are the haves (Alabama, for example) and the have-nots (UAB). 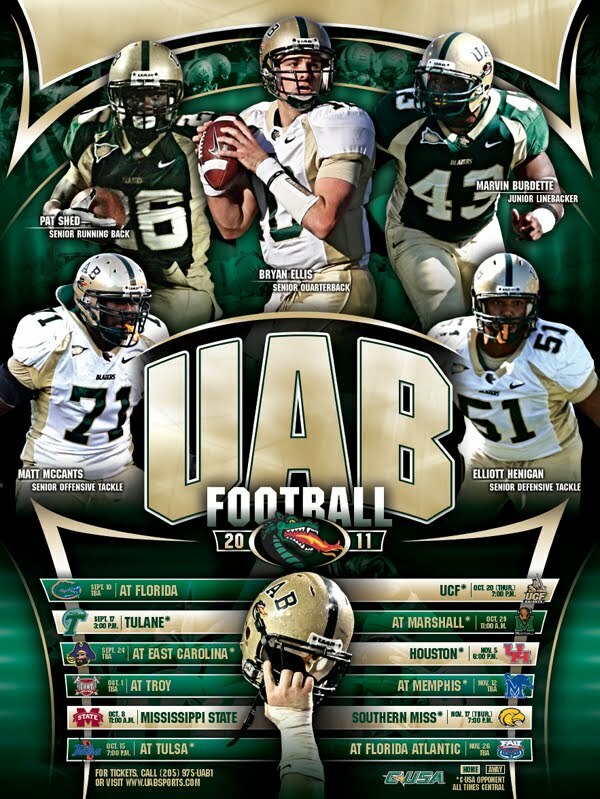 Even though UAB is classified a I-A team, it's not. As Tim Stephens pointed out last week in the Orlando Sentinel's College Gridiron 365, UAB is one of 32 non-Bowl Championship Series teams that spent less on its entire program in 2007-08 ($5.3 million) than Alabama will spend on its coaching staff this season ($6.5 million). Legendary sportswriter Wendell Barnhouse recently left the Fort Worth Star-Telegram and is now a correspondent for Big 12 Sports.com. With 30 years experience of observing the college scene, his expertise is unmatched. In the spirit of Steve Harvey's Bottom Ten, Wendell will provide us a capsule look at college football's less fortunate, counting down the Bottom 25 teams in Division I-A football. Conference: Conference USA, East Division. Coach: Neil Callaway, 2-10, one season. Division I-A history: 91-96-2 in 17 seasons, .486 winning percentage. Best record in last five years: 7-5 in 2004. Rank(ed) because: Even when this program started out as a Division III team in 1991 (and lost its first game to Millsaps, 28-0), the Blazers never failed to win at least four games each season. 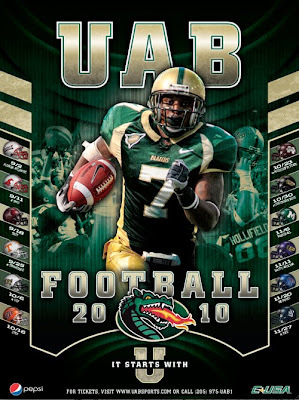 In Watson Brown's final season (2006), UAB won three games. In Neil Callaway's debut season, the Blazers went one worse and won only two games. As CUSA has improved, UAB has slipped. Negative number: In UAB's 10 losses, the Blazers gave up fewer than 30 points only once — a 25-9 loss to Memphis. In five of the losses, UAB gave up 40 or more. Possible victory: At Tulane, Nov. 15. Selecting a conference road game is a leap of faith. But the Green Wave also reside in the Bottom 25 (No. 11). 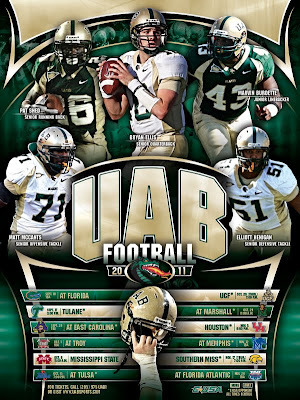 If UAB hasn't lost hope by this point of the season, this is a game it should win. Biggest blowout: At Tennessee, Sept. 13. The Volunteers will be looking to move up in the polls and tune up for their game with Florida the following Saturday. The Blazers have to hope Tennessee is lacking focus. Is there hope? : A number of players left the team before last season because of raised standards in academics, offseason behavior and workouts. That reduced the roster to 60 scholarship players and contributed to the 2-10 record, but Callaway believes that sent a message and that his staff is recruiting solid citizens who also are good players. Thanks to the Helmet Project.